Allie Herman had been a whirligig of activity, from playing volleyball, basketball, and softball to 4-H activities and showing cattle at the county fair. 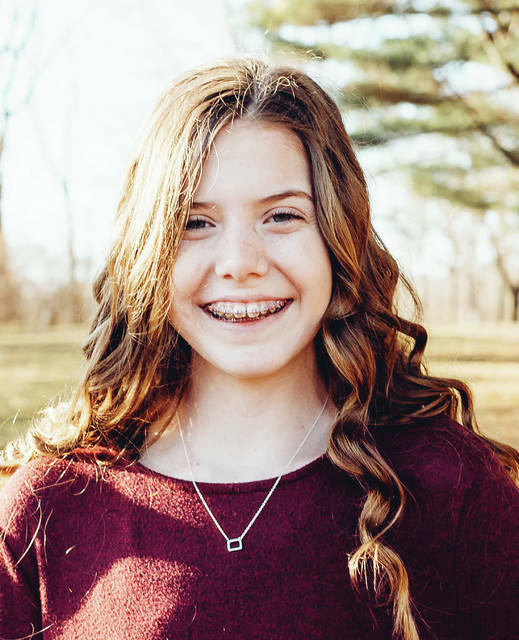 So it’s fitting that the 13-year-old Stryker girl, who has battled bone cancer since last October, will be the recipient this Sunday of “All for Allie,” a 5K run/walk fundraiser at the east side of Harrison Lake State Park in Fayette. Coordinated by Bryan and Heidi Stambaugh, Fayette Elementary School teacher Amy Mitchell, and the Fayette Athletic Boosters, the event will begin with registration at 3 p.m. A one-mile fun run with a $10 registration fee starts at 4 p.m.; a 5K run/walk with a $30 registration fee starts at 4:30 p.m. The activities will be near the park’s beach and picnic area. Men’s and women’s age categories are 14/under; 15-19; 20-29; 30-39; 40-49; 50-59; and 60-plus. As of last week, 95 individuals had pre-registered. Barbecue will be available, and Nune of Loco Sounds will supply music. A limited number of commemorative T-shirts will be sold on a first-come, first-served basis. Some volunteers for the event are Allie’s friends from the Franklin Blue Ribbons 4-H chapter. Heidi Stambaugh, whose children attend Fayette schools, said she wanted to do something for the Herman family to show community support for Allie. “As a mom, your heart hurts for the family,” she said. Participants are signing up from all over northwest Ohio, “so it’s going to be a really nice turnout. I’m very happy about that,” she said. It will be the third fundraiser for Allie. Friends of the Herman family held a gun raffle in January, the Stryker Fire Department held an event in February, and community member Elwin Bates hosted an open house at the Fayette Opera House this past weekend to raise funds. All proceeds will help offset Allie’s medical bills. A Fayette Schools seventh grader, Allie played volleyball last fall under the coaching of Amy Herman, her mother and elementary school teacher. Allie complained about a nagging pain in her left knee but stayed active. It was when the pain became intense that she visited her family doctor in October. X-rays showed nothing definitive. Allie was referred to Aaron Beurk, a pediatric orthopedic surgeon in Toledo. After performing magnetic resonance imaging and Computed Tomography scans he agreed her X-ray results weren’t typical. She was placed on crutches and her ailment was treated like a broken leg. A trip to the emergency room confirmed Allie’s condition was atypical. Following a second trip to Dr. Beurk she was referred to Dr. Thomas Scharschmidt, a pediatric orthopedic oncologist in Columbus. Allie was given a bone biopsy Dec. 4 at James Cancer Hospital and Solove Research Institute at Ohio State University. She and her parents were distressed to learn she has osteosarcoma, a type of bone cancer. Then at Nationwide Children’s Hospital in Columbus they received news the cancer had metastasized to a spot on her lung. Two days later, a port was installed in Allie’s chest to accept chemotherapy. She underwent surgery Feb. 22 to have the knee tumor successfully removed and to get a total joint replacement. A second surgery April 22 will remove the lung tumor, which chemotherapy has rendered inactive. Her illness has often left Allie homebound and curbed many of her activities. Thanks to technology, however, her education isn’t one of them. Through an OSU grant program, she can hook up her iPad to a mobile robot located at her school. An iPad attached to the robot allows Allie to attend and participate in a shortened day of classes through FaceTime. After recovering, Allie would like to continue participating in sports, if her doctors approve. “If not, I will try some new things,” she said. Herman said the entire family, including Allie’s brother, Brayden, have experienced the highs and lows of her illness. But they accept that her cancer is something they must all fight. Donations continue to be accepted. Make checks payable to Fayette FCA, and send them to: Fayette Local Schools, Fayette FCA, 400 E. Gamble Road, Fayette, Ohio 43521.